Many commercial drone operations require an Special Flight Operations Certificate (SFOC) BUT this isn’t needed all the time. Here is a summary of how to determine if you you planned flight operations is exempt. 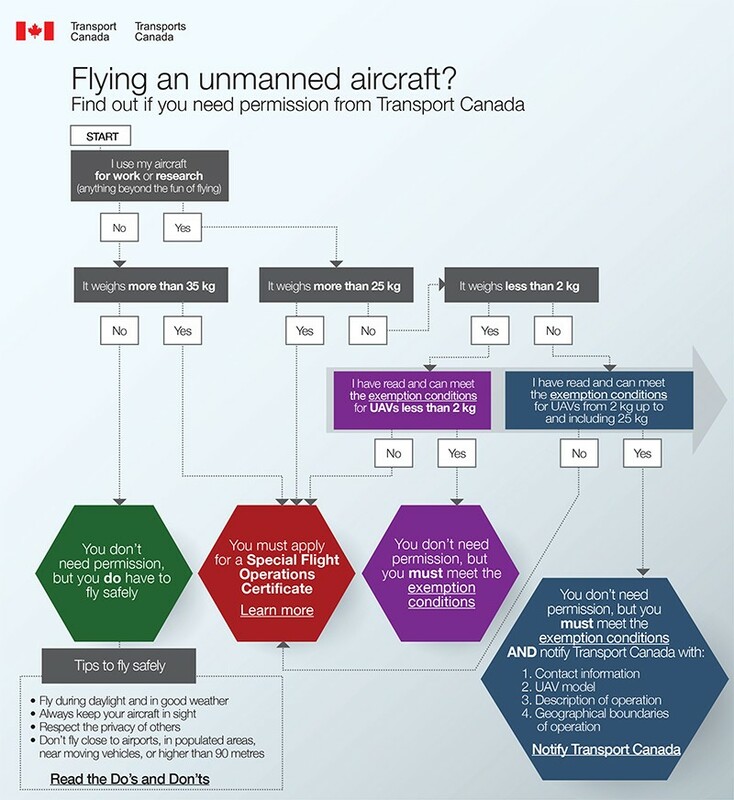 Check out this Transport Canada Flow Chart. For most businesses there are basically two scenarios, drones with a mass less than 2kg and those between 2kg-25kg. Fly under the 2 kg exemption requires MUCH less as compared to flying under the 2kg-25kg exemption. Basically this means that they have left it up to the courts to decide. You will need to predict how a court would “view” the flight location based on the known information presented to the public and what is commonly understood. For example, if you fly near the CN Tower, it’s reported and you claim to be flying under exemption, though you may fulfill all of the other exemption requirements it HIGHLY likely that a court will view this area as “built up”. In addition, the Advisory Circular (AC) N0. 600-004 4.2 (26) says, “Built-up areas are considered areas with groups of buildings or dwellings including anything from small hamlets to major cities. Anything larger than a farmstead should be considered a built up area”. With this in mind if your flight is taking place within 10 kms some area that is larger than a “farmstead” simply be safe and apply for your SFOC. If you UAV is less than 2kg and you can meet the exemption conditions you can fly legally and DO NOT have to advise Transport Canada. a copy of the UAV operating specs, speed, maximum operational wind conditions, flight times etc. Any person conducting operations under this exemption shall conduct a safe operation and shall not pose a risk to aviation safety. Any person operating under this exemption shall not operate a UAV system in such a reckless or negligent manner so as to endanger or be likely to endanger the life or property of any person. Any persons operating under this exemption shall be a minimum of 18 years of age, or be at least 16 years of age and conducting research under the supervision of an academic institution. Any person conducting operations under this exemption shall subscribe for liability insurance covering risks of public liability at the levels described in subsection 606.02 (8) of the Canadian Aviation Regulations and in any case shall have no less than $100,000 in liability insurance coverage pertaining to the operation of the UAV system. The pilot operating under this exemption shall not operate the controls of a UAV if they have any reason to believe that they are suffering or are likely to suffer from fatigue, or suffering from any other condition which would render them unfit to perform their duties. The pilot operating under this exemption shall not operate a UAV system within eight (8) hours after consuming an alcoholic beverage or while under the influence of alcohol or while using any drug that impairs the person faculties to the extent that the safety of the operation is endangered in any way. Any person conducting operations under this exemption shall be familiar with the relevant aeronautical information that is appropriate to the intended flight, before commencing a flight. Any person operating under this exemption shall not operate a UAV in any special aviation event requiring an SFOC under Part VI, Subpart 3, Division 1 of the Canadian Aviation Regulations. Any person conducting operations under this exemption shall obtain permission from the owner(s) of the property on which a UAV intends to take-off/launch from and/or land/recover on. Any person conducting operations under this exemption shall, prior to commencing operations, perform a site survey to assess the suitability of each location and confirm that safe operations can be conducted. Any person conducting operations under this exemption shall cease operations if at any time the safety of other airspace users or persons or property on the ground is in jeopardy, or if the person conducting operations is unable to comply with the conditions of this exemption. A copy of the UAV system operating limitations. A person conducting operations under this exemption shall immediately produce any of the documents and/or information listed in condition 12 to a peace officer, police officer, or Transport Canada inspector upon request. No person operating under this exemption is relieved from complying with the provisions of any other relevant Acts, Regulations or laws or from any level of government. The pilot operating under this exemption shall maintain continuous unaided visual contact with the UAV sufficient to be able to maintain operational control of the UAV, know its location and be able to scan the airspace in which it is operating to decisively see and avoid other air traffic or objects. The pilot operating under this exemption shall not use a first person view device. The pilot operating under this exemption shall only operate a UAV from a single control station and control relays or visual observers to extend the operational area are prohibited. The pilot shall operate no more than one UAV at any one time. The pilot operating a UAV shall give way to manned aircraft at all times. The pilot conducting operations under this exemption shall only operate a UAV during daylight hours. The pilot operating under this exemption shall operate a UAV at or below 300 feet above ground level (AGL). The pilot conducting operations under this exemption shall only operate a UAV in Class G airspace. The pilot operating under this exemption shall not operate a UAV over a forest fire area, or over any area that is located within five nautical miles of a forest fire area. The pilot operating under this exemption shall not operate a UAV in airspace that has been restricted by the Minister under Section 5.1 of the Aeronautics Act. The pilot operating under this exemption shall only operate a UAV at least five (5) nautical miles from a built up area. The pilot operating under this exemption shall operate a UAV at a lateral distance of at least 100 feet from any building, structure, vehicle, vessel or animal not associated with the operation and at least 100 feet from any person. The pilot operating under this exemption shall not operate a UAV over an open-air assembly of persons. The pilot conducting operations under this exemption shall only operate a UAV under visual meteorological conditions, clear of cloud with not less than two (2) statute miles ground visibility. The pilot conducting operations under this exemption shall be able to take immediate active control of a UAV at all times. The pilot conducting operations under this exemption shall establish and follow normal, lost link and emergency procedures, including those established by the manufacturer. Any person conducting operations under this exemption shall confirm that no unacceptable radio frequency interference to the UAV system is present prior to flight, nor is likely to be present during flight. The pilot operating under this exemption shall not operate a UAV system unless it is operated in accordance with the operating limitation specified by the manufacturer. The pilot operating under this exemption shall not conduct a take-off/launch of a UAV if explosive, corrosive, bio-hazard or bright light emitting (laser) payloads are carried onboard. Any person conducting operations under this exemption shall ensure that the appropriate air traffic service unit(s) is advised immediately anytime the flight of a UAV inadvertently enters into controlled airspace. The pilot conducting operations under this exemption shall be appropriately trained on the UAV system and qualified for the area and type of operation as referred to in Transport Canada guidance material. Any person conducting operations under this exemption shall ensure that a UAV system is in a fit and safe state for flight prior to take-off/launch. Name(s) of individuals responsible for following each of the above procedures. 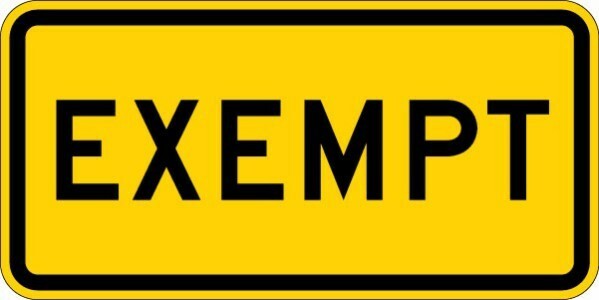 Any person conducting operations under this exemption shall establish and adhere to an emergency contingency plan. Any person conducting operations under this exemption shall be a minimum of 18 years of age. A copy of the following documents shall be accessible to any person conducting operations under this exemption. The pilot operating under this exemption shall only operate a UAV during daylight hours. Only persons inherent to the operation are present. The pilot operating under this exemption shall operate a UAV at a lateral distance of at least 500 feet from the general public, spectators, bystanders or any person not associated with the operation. The pilot operating under this exemption shall not activate a flight termination system, if a UAV is so equipped, in such a manner as to endanger other airspace users or persons or property on the ground. Any person operating under this exemption shall not conduct a take-off/launch of a UAV unless the risk involved with lost link circumstances has been assessed and a determination has been made as to when auto-recovery manoeuvres or flight termination shall be initiated. The pilot operating under this exemption shall not operate a UAV in known or forecast icing conditions. The pilot operating under this exemption shall not conduct a take-off/launch of a UAV that has frost, ice or snow adhering to any of its critical surfaces. The pilot operating under this exemption shall not permit the use of a portable electronic device at the control station of a UAV system where the device may impair the functioning of the systems or equipment. The pilot operating under this exemption shall not conduct a take-off/launch of a UAV if explosive, corrosive, bio-hazard or bright light emitting (laser) payloads, or any payloads that can be jettisoned, dispersed or dropped, are carried onboard. a hand-held fire extinguisher of a type suitable for extinguishing fires that are likely to occur. The pilot conducting operations under this exemption shall remain clear of the take-off, approach and landing routes and the pattern of traffic formed by manned aircraft operating in the vicinity of aerodromes. The pilot operating a UAV under this exemption, before entering or operating within in the Canadian Air Defence Identification Zone (ADIZ), shall comply with section 601.145 of the Canadian Aviation Regulations. Any person conducting operations under this exemption shall ensure that a UAV is not flown if it has been subjected to any abnormal occurrence unless it has been inspected for damage and repaired, if needed to ensure safe operation. Any person conducting operations under this exemption shall ensure that all maintenance, servicing and disassembly-assembly of a UAV system and associated components are performed in accordance with procedures described in the manufacturer’s specifications. Any person conducting operations under this exemption shall ensure that the requirements of any airworthiness directives, or equivalent, issued by the manufacturer have been completed. Any person operating under this exemption shall ensure that the UAV is not equipped with an emergency locator transmitter (ELT). The geographic boundaries of the operation. Any person operating under this exception shall notify the Minister within 10 working days of any change to the information provided in the above condition or upon the permanent cessation of UAV system operations. Any other incident that results in a Canadian Aviation Daily Occurrence Report (CADORS). Any person conducting operations under this exemption shall, following any of the aviation occurrences listed above, cease operations until such time as the cause of the occurrence has been determined and corrective actions have been taken to eliminate the risk of reoccurrence. Previous Previous post: Should I Buy the Phantom 3!? !